The Yorkshire based company whose brands include Laptops Direct and Appliances Direct delivers thousands of electrical appliances directly to consumers daily and manages end-to-end product fulfilment for national retailers including Debenhams. 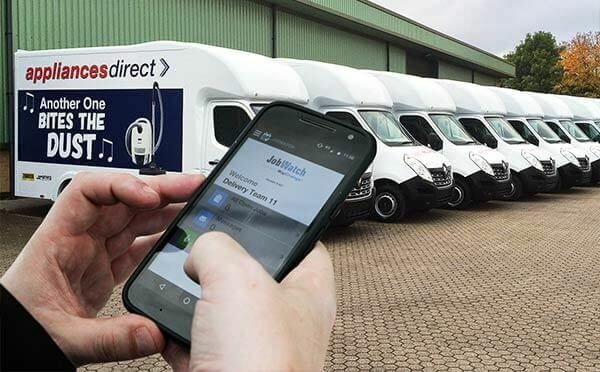 BigChange’s three-in-one solution is delivering a paperless revolution for Buy it Direct and combines cloud-based delivery planning and scheduling, an Android mobile app for drivers and real-time tracking of the vehicle fleet. With fast efficient next day delivery being a key part of Buy It Direct’s offering, the company were looking for an integrated system that would deliver a truly seamless customer experience and chose BigChange after evaluating a number of competitive systems in the market. Prior to adopting the JobWatch solution, Buy It Direct were reliant on a paper based system including paper based manifests and delivery notes that drivers were required to collect in the morning and return for processing and filing at the end of each day. Without real-time visibility of the operation, the contact centre were making multiple phone calls to drivers to check the status of deliveries. The new solution is fully integrated with Buy it Direct’s routing software and the entire delivery process is automated on rugged Samsung tablets. At the start of each day, drivers start their timesheet and complete an electronic vehicle walkaround check, logging any defects that are automatically alerted to fleet managers. Drivers have instant access to their delivery manifest and the app navigates them efficiently from job to job, with the benefit of live Google traffic information. Customers automatically receive a courtesy message by text message, giving them an accurate ETA for delivery. On arrival, items are scanned and verified using the JobWatch app and photos taken before, during and after each drop, providing robust proof of delivery and product condition. Custom worksheets guide the delivery team step by step through installation procedures. Additional photos are captured for installation of white goods (e.g. test washes and connection to water and waste pipes). Proof of delivery with signature is captured at the end of the process. This information is instantly relayed to the back office and customers immediately receive delivery confirmations by email. Buy It Direct have been able to optimise and streamline their delivery operation. The BigChange system has provided business intelligence into how long it takes to deliver specific types of products. Previously too much time was allocated to each drop, creating wasteful slack in the schedule. This new insight means that productivity has been increased with more drops taking place per vehicle per day. Capacity across the operation has been increased without the cost of additional drivers or vehicles. The new technology has also assisted with management of the vehicle fleet, with the daily driver checks allowing robust management of defects. The live tracking system monitors and reports on driver behaviour, providing a motivational de-brief at the end of each day.